In the bowl of a stand mixer, cream together the butter and brown sugar until well combined, light and fluffy. Add the eggs and beat until combined. In a separate medium-sized bowl, whisk together the flour, baking soda, salt and cream of tartar. With the stand mixer set to the lowest speed, slowly add the flour mixture to the butter mixture until just combined. In a separate bowl, stir together the granulated sugar and cinnamon. Use a small ice cream scoop to scoop out cookie dough and drop into the mixture. Roll it around to coat all sides and then place on the baking sheet. Cookies should be about 3 inches apart. Bake in the center of the oven for 9-11 minutes, until golden on the edges. Let cool for one minute before transferring to a wire cooking rack. 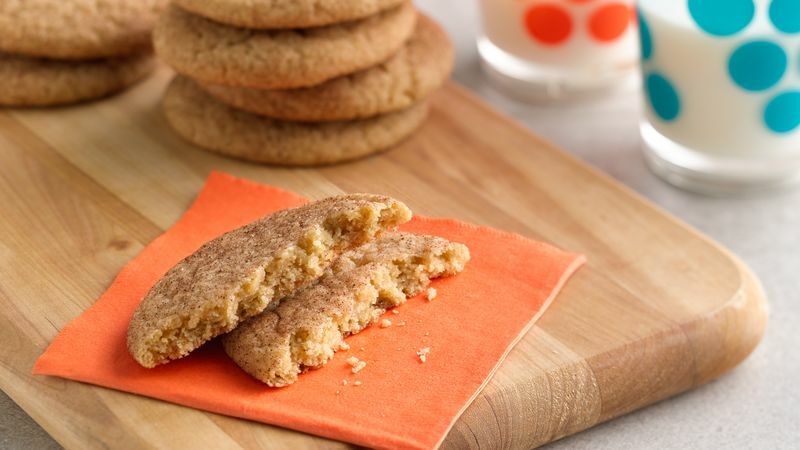 These cinnamon-sugar Snickerdoodles are about as delicious – and easy -- as cookies can be. Snickerdoodles are a special cookie. The dough is rolled in a cinnamon-sugar mixture before baking, so the cookies come out encrusted in that sweet, comforting mix. Really, it’s divine. You might say that I'm a little obsessed with Snickerdoodles. When I was a little girl, my school created a cookbook as a fundraiser and in that book was a recipe for Snickerdoodles. I never forgot about them. Fast forward, oh, 20 years or so. I spied a recipe for Snickerdoodles in Fine Cooking and had to make them. Now, mind you, though I was obsessed with these cookies, I had never actually eaten them, so I had no idea what to expect. Wow. Just wow. You’re going to want to make these too. They’re amazing Christmas cookies or an anytime treat. Mix up the dough and scoop it up in little balls. Roll those balls into the cinnamon-sugar mixture. Place the coated balls on a parchment-lined baking sheet. Leave them in their little ball shapes – they’ll spread out during baking. Bake at 350 for 9 to 11 minutes or so, until the edges are golden. Cool the cookies on the baking sheet a minute before removing them to a rack to cool completely. Then, please, do dig in. Milk or coffee optional. Sarah W. Caron is a food writer, editor and blogger who writes about family-friendly foods and raising a healthy family at Sarah’s Cucina Bella.